Both are yuri, and have similar settings; I think Aoi Hana is the better of the two, granted, since while it is also slow boil, the heroines have a pre-existing friendship to build on rather than the suddenness Bloom Into You goes for. Both series are slow burn romance between females. Both has more portrayal of the relationship between each protagonists, and how they thought. Both has more stories about side characters. These two yuri shows are far from your typical romance anime. Instead of having the main pair fall in love with each other right away, the series focus on the complex relationships between the characters and how their feelings develop. The side characters and their relationships are also an important aspect of the plot, whereas most romance anime predominantly focus on the main cast. If you're looking for a character-driven yuri series with plenty of development, you should definitely give these two a try. They both approach Shoujo Ai in a mature and somewhat subtle way, all the while avoiding overused tropes and other pitfalls. They both feel very grounded in reality and never stoop so low as to rely on fanservice in order to sell the show. Both anime has shoujo ai, both have kiss scenes too, but sakura trick is a lot more aggressive and also both are trying to hide their relationships from friends and family members. I recommend watching both if you liked either one. 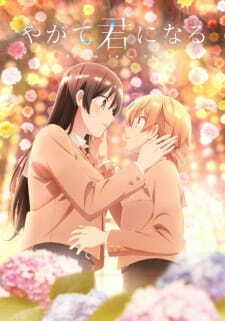 Yagate Kimi ni Naru is about self-acceptance and growth through romantic love. 3-gatsu no Lion is also about self-acceptance and growth, this time through the the warmest care I've ever seen animated, given by our 3 sisters who more or less adopts our main character into their household. Over time he learns to take care of himself, realises his identity, and in turn can begin to care for others. Both are great love stories and both focus a lot on personal growth. Some of the side characters are similar but the story itself isn`t. But I believe if you liked one, you will like other. Both are stories about two girls and their relationship, also, the direction of YagaKimi is inspired by Naoko Yamada's (the director of Liz to Aoi Tori) to an extent i.e. with the focus on body language and specific body parts in telling the story. Furthermore, both use visual metaphor in service of expanding upon the explicit narrative portrayed. Do you want to watch a show that covers a wide swath of LGBT issues with relative seriousness and delve into numerous different ideas about human identity? Do you enjoy shows that revel in quiet softness and faint, sad smiles? Of course you do, and both Hourou Musuko and Yagate Kimi ni Naru do exactly these things.